Join ARxC Rx in Reach Team and join the fight to conquer arthritis! Please support the ARxC Rx in Reach Ga Team at the Arthritis Walk to A Cure. This Walk is important to me because I live with Systemic Lupus Erythematosus. The Rx in Reach Coalition, led by ARxC, consists of 36 health centered groups and physician organizations that worked together to pass Step Therapy Reform, HB 63. The Arthritis Foundation, GA is a founding member. 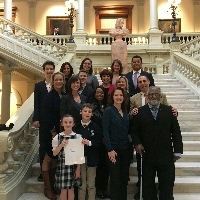 This year, the Rx in Reach Ga Coalition made history, by helping to pass critical legislation for all arthritis patients: HB 63 Step Therapy Reform! HB 63 will allow patients to be covered for the drugs their doctors know they need, no longer forced to 'fail' on medications that are less effective. This year we walk in Honor of the Walk Honoree Meredith Boyd! a dear friend of ARxC and a true Arthritis Warrior! You can help us to continue this work by donating today, whatever you can and join our Team! We are working hard for you!